This is the heart-warming story of Mia! 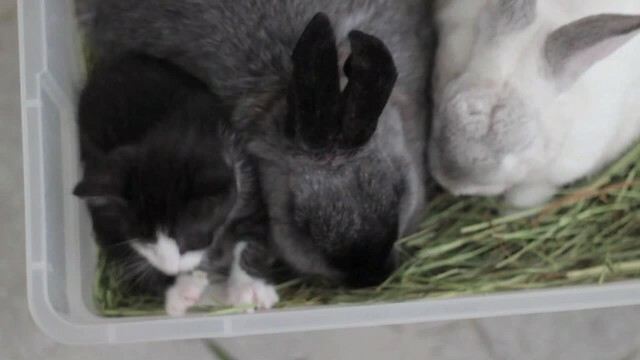 Mia is a tiny kitten without a mother was put in with a family of rabbits to at least have some company and some snuggle companions. But here’s the end result .. this adorable wee one of a kitten now believes she is a rabbit herself! Mia had no problems fitting in with them and the rabbits, in turn, have accepted Mia as one of their own. The rabbits are named Melba and Marlowe. They couldn’t love and care about Mia more than they already do. Marlowe immediately became a sort of father figure to Mia. By nature, Marlowe has always been a bit protective and that did not change with the addition of Mia to their furry circle. Once their humans themselves saw how close they had all became as a family, they just knew it wouldn’t be a good idea to separate any of them. Isn’t it amazing how animals just seem to know when a wee one is in need of some good family structure?